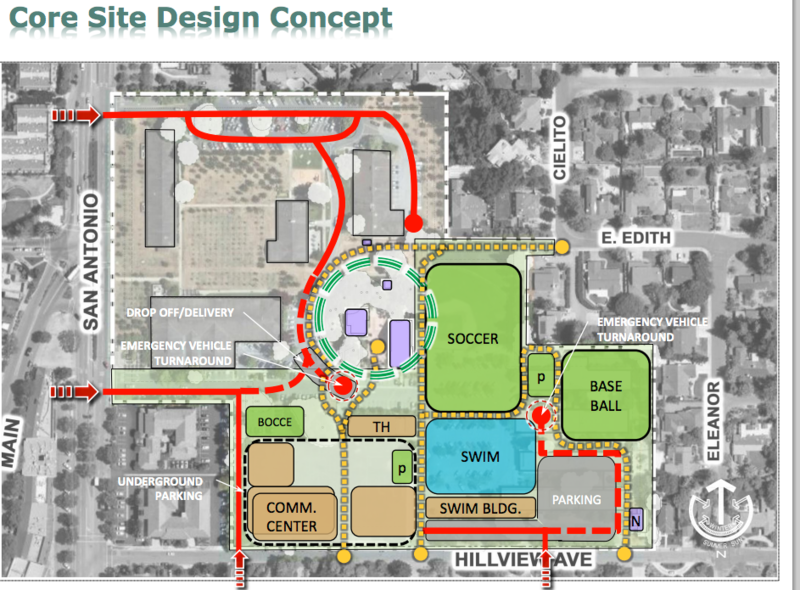 -The City of Los Altos has placed a Bond issue (Measure A) on November 2015 ballot to increase property taxes to partially fund the construction of a new, super-sized 55,600 sq ft Community Center and Multi-Pool Swim Complex over Hillview Park . Restarting after a resident poll determined an $81 Million Phase 1 2009 Master Plan "unfundable", this new fast-tracked plan proposes a more expensive project including a relocated and super-sized Community Center, a three-pool Swim Complex and building, relocation of sports fields, removal of Park elements, and incorporation of underground parking throughout Hillview Park. This revised project DOES NOT include any funds, improvements, upgrades, or construction for the Library, Civic Center and City Services, Theater, Police, ... or any development on the Northeast Civic property or new San Antonio entrance. Additionally, it does not address any community-requested desire for a Downtown connection or increased family Park areas or exterior community gathering areas/greenspace. (Note: Two micro play areas --P--- on map total 1,297 square feet of non-programmed greenspace, lawns, playgrounds... area for the new "Hillview Park ," less than .5% of the total surface area under development . This new project calls for development for a 55,600 sq foot Community Center to be relocated and expanded for rental use. This size is more than 3 times the community space see today at current Hillview Community Center. Today 10,000 square feet is available for classes and rental, 3 classrooms are dedicated to the seniors and there are a select number of offices for recreation and community needs. (Total is approximately 16,000 square feet) The remainder of the building area is dedicated and leased to two schools -a preschool and an language school . There is no data or publicly available utilization and use analysis of the current Hillview Center, or whether it is rented out to residents and non-residents. The Multi-Pool Swim Complex will include a hardscaped and fenced area nearly the size of downtown Los Altos city block. 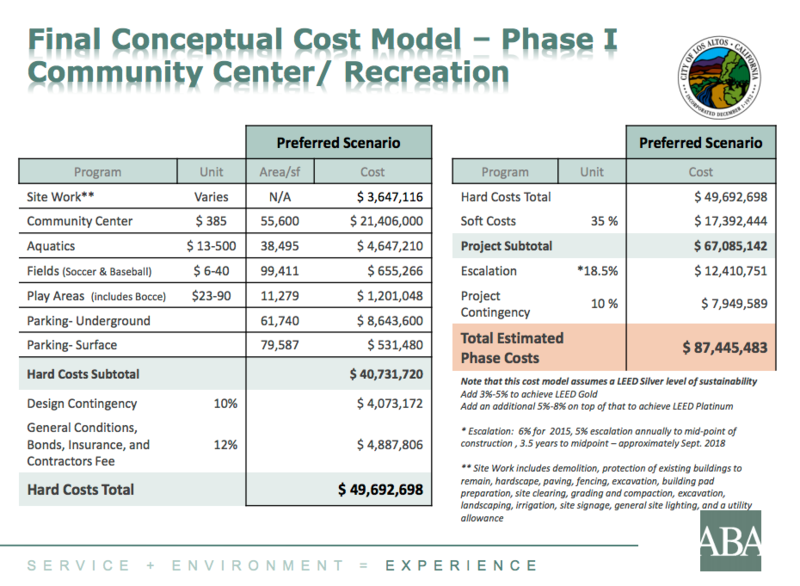 It will include 3 separate pools, with no decision on how it will be managed and operated---or how much it will cost Los Altos residents to use . Ongoing maintenance costs, insurance, upkeep, water costs, operating subsidies, etc. after the pools are built are NOT included in this plan or budgeted. Additionally, community-developed and directed Design Drivers developed for the 2009 Master Civic Plan were discarded and not used for planning development in this project. 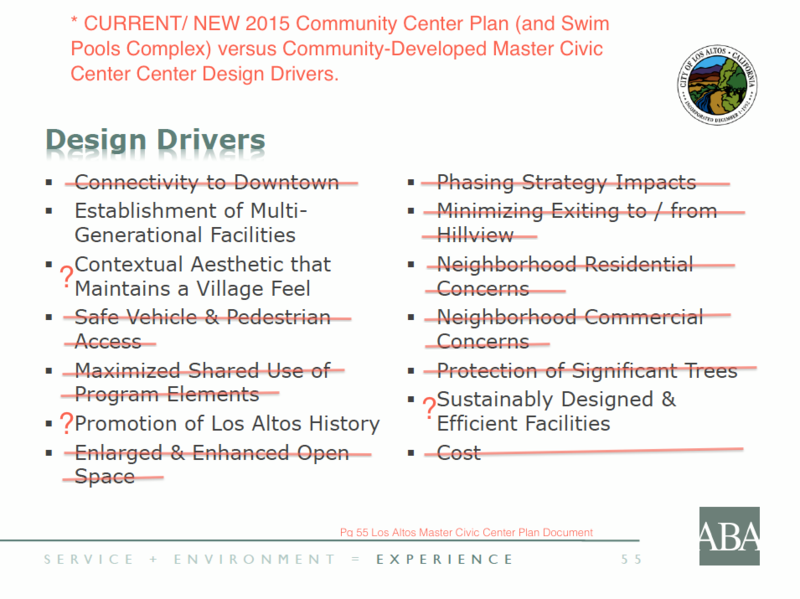 See how this plan stacks up to Los Altos Community Design Guidelines for the Civic property. 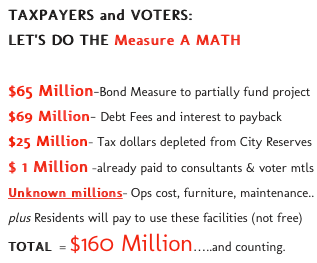 The cost for construction is now estimated by the City to be $160 MILLION* (click to see) including payback of the Bond Measure A and use of City Reserves. A large part of the project will be funded out of a $65 million general Measure A bond paid by increasing property taxes for every Los Altos resident. Property taxes will be paid for 30 years, and it is estimated that the total bond will cost $134 Million over the life of the bond for interest, bond servicing and principal repayment. Additional funds of $25 Million dollars will come from City Reserves, some of which were previously allocated or accrued for other citywide projects, including funds to repair the sewer system, address downtown parking and citywide repair and development. Nearly $1 million dollars has been spent to-date on planning for the Master Civic property, including consultants, architects, mailers. New City funds have been approved to hire a bond "consultant" to determine public education / marketing needs and pay for a special election for voters to approve on Nov 2015 ballot. The cost is estimated at $200,000 - $300,000, not including City staff time. The Bond Measure requires a 2/3 vote by Los Altos voters to approve this measure and tax. The election will likely be a November 3 election and mail-in voting will begin October 5. VOTE NO wAy on MEASURE A. 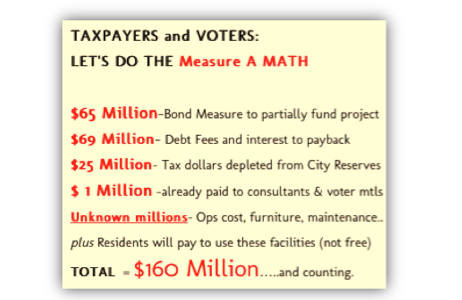 Know to NO on Measure A Opposition Campaign - neighbor to neighbor activities, events, education and information sharing. Sign up for petition and email list for up-to-date news. Volunteer by sending us a note at hello@losaltosneighbors.com . Neighbor event hosts, outreach, article/blog writers, neighborhood leads, and friendly folks all welcome. mid September Ballot information materials will be sent out via mail to all Los Altos households. October 5-8 Official Election Ballots to arrive by mail -- Vote by Mail and Absentee Ballots can be sent in. ARE YOU A LOS ALTOS NEIGHBOR? *Are you a resident who lives in Los Altos or Los Altos Hills? *Are you a resident that frequently walks, rides a bike, shops, entertains, gathers with friends here in Los Altos?